By 1900, Navajo and Pueblo silversmiths were making all of the jewelry forms now considered Southwestern classics. Because silver was not an indigenous craft, however, the origin of these forms reveals a remarkable mixing of cultures filtered through Native vision and inventiveness.The concho belt is a perfect example. From the Spanish concha or shell, the domed silver conchos may have been derived from Spanish buckles or from the German- silver “hair plates” that Anglos traded to the Plains Indians. Certainly the idea of stringing the conchos on a strip of leather came from the hair plates (although Plains Indians wore them hanging from the back of the head rather than around the waist), but their decoration closely followed that found on fancy iron lock escutcheons made by Spanish blacksmiths. 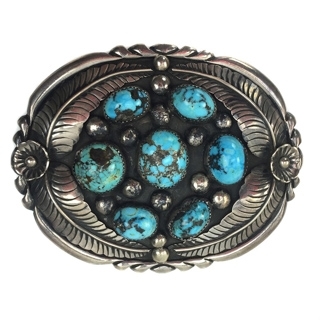 Dan Simplicio - Zuni Turquoise, Coral, and Silver Belt Buckle with Leaf Designs, c. 1950s, 1.375" x 2.75"
Gene Gibson - Navajo Sterling Silver Overlay Link Concho Belt, c. 1970, 34"
Hopi Sterling Silver Linked Concho Belt c. 1970s, fits a waist size of 41"
Jackie Singer - Navajo Turquoise, Coral and Silver Belt Buckle with Bear Claw c. 1960-70, 2.75" x 3.75"
Jennie Blackgoat (1932-2005) - Navajo Concho Belt c. 1970-80s, fits a waist size of 28" to 35"
Joseph H. Quintana (1915-1991) - Cochiti Silver Overlay Belt Buckle c. 1930, 1" x 2.5"
Joseph H. Quintana (1915-1991) - Cochiti Turquoise and Silver Belt Buckle c. 1930, 1" x 1.5"
Kenneth Begay, White Hogan - Navajo Sterling Silver Belt Buckle, c. 1960s, 1.125" x 2.25"
M. Chee - Navajo Number 8 Turquoise and Silver Belt Buckle c. 1960, 3" x 3.875"
Navajo Arts & Crafts Guild Silver Concho Belt, c. 1943, 35"
Navajo Silver and Leather Concho Belt c. 1920, Fits Waist 27-32"
Navajo Silver and Leather Concho Belt c. 1920s, fits 32-35"
Navajo Silver and Leather Concho Belt, circa 1940s, Fits waist 41"
Navajo Silver Belt Buckle, c. 1940s, 4" x 3.5"
Navajo Silver Concho Belt, c. 1940s, Fits 24"-30"